I know that DrawCamp should be about pencils and pens and paper and such… or should it? 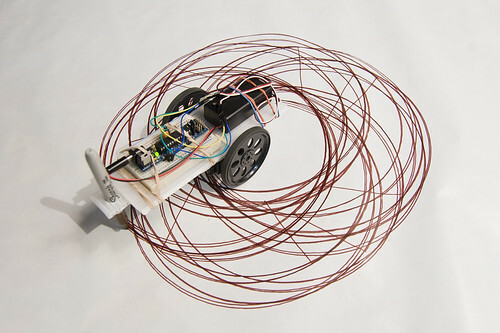 I’ll be bringing the Egg-Bot, as well as the Friday Night Drawbot (if I can reassemble it before then) as well as a bunch of slides and a talk on robotic drawing devices. DrawCamp was held June 12, 2010 at Bucketworks in Milwaukee, Wisconsin. Mike Rohde Expert Sketchnoter from the Sketchnote Army was on hand to demonstrate his skills, and I managed to point a camera at him and record the event. If you draw, sketch, think visually, or just like scribbling, make your calendars for DrawCamp on Saturday, June 12th, 2010! In 2009 we held Milwaukee’s first PhotoCamp, and I like to think of DrawCamp as sort of being complimentary to that, as they both seek to bring together people interested in the visual arts. So if you’ve ever put a pen to paper, or chalk to sidewalk, or a stylus to screen… we want you there. DrawCamp takes place Saturday, June 12th, 2010 at Bucketworks in Milwaukee, Wisconsin. Register at DrawCamp.org (DrawCamp is free to attend thanks to our sponsors, but we are asking for donations, and 100% of participant donations will go directly to ArtWorks Milwaukee and to MIAD‘s pre-college scholarship fund. You can also follow DrawCamp on Twitter, and I hear celebrity Sketchnoter Mike Rohde will even be there!